Visiting mom’s place means making recipes and clicking photos and creating a bank of posts to share with you guys as soon as I come back. This year other than the recipes which I had planned, due to perfectly timed (by God, not me) rains and wind, we had about 50 kgs of raw ‘desi’ variety of raw mangoes to use up in 2 days before they start rotting, and that’s what we did. 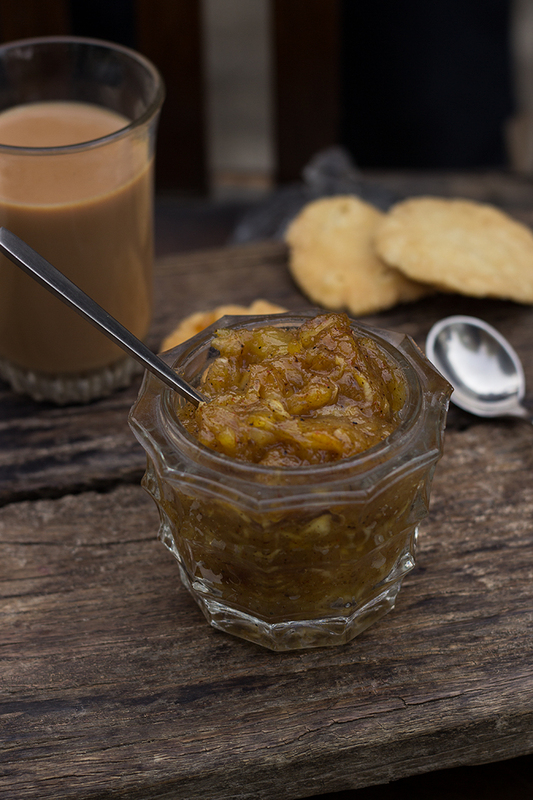 We ended up making loads of aam panna, aamras, mango preserve, mango pickle and this mango chutney. The recipe is very simple and requires little work except grating the mangoes which also can be achieved very quickly in a food processor. It is best to let the mango pulp marinate for 2-3 hours with salt and sugar, it lends an amazing flavour and shorten the work further of cooking. If you do not get a chance to marinate then also it is OK to add salt, sugar and all other spices together at the time of cooking. As a kid I loved adding this chutney to all my food, from dals, veggies, khichdi to enjoying it with mathri, book and a cuppa.